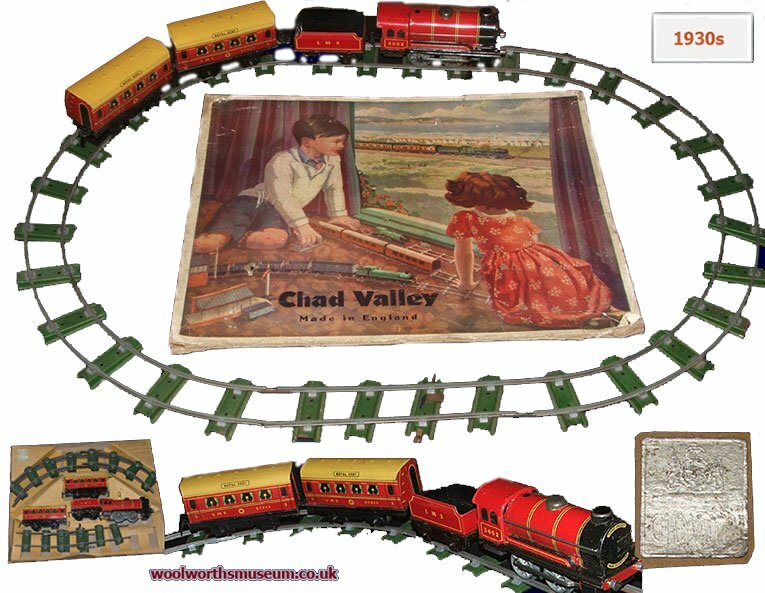 In Edwardian times the Johnson family built one of the worlds premier toy brands, which became Chad Valley. They sustained the market-leading position for much of the twentieth century. An initial idea to transform a publisher's left-overs into playthings, morphed into a sophisticated engineering and modelling business, and a franchise-specialist. The creative Harborne team, based in the valley of the River Chad, made agreements with some of the world's great companies, helping to market their creations across the globe. It became toymaker to the White Star shipping line, to H.M. Government, to the Great West Railway, and ultimately to Her Majesty Queen Elizabeth. She chose the company to fashion dolls of her young daughters, the present day Queen of England, and her beloved sister Margaret Rose. Such quality commanded a premium price. Many of the toys were destined for the upper classes, costing several weeks' wages for most people. The legacy endures and prospers to this day as one of Britain's favourite brands, thanks in part to the foresight of the down-market retailer, F.W. Woolworth. This page explores Chad Valley's early history. Chad Valley Toys have given pleasure to eight generations of children, from the present Queen of England, to kids across Europe, North America, Africa, India, Australia and New Zealand. Some of the toys have been simple, many have been sophisticated; some have been "just for fun" while others have nurtured young minds and helped scholars to map the world we live in. One common feature has applied throughout the 156 years history, a build quality that has consistently been second to none. Why else would early Chad Valley be among the most sought after collectabless on the world-wide web? And why do their antique toys so often carry the description "well used but in surprisingly good condition for its age"? On this page we take a whistle stop tour of the Company's early days as purveyors of playthings to the nobility. The Chad Valley name first appeared on toys in around 1920. This was a new trademark for a printing company that had already been in operation for around ninety years. Anthony Bunn Johnson, a British printer, had first begun to make simple children's games in around 1830. 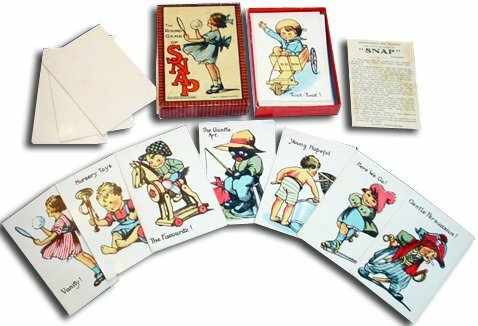 These had consisted mainly of pictures on paper or card, normally accompanied by a printed set of rules or instructions. In 1860 his two sons, Joseph and Alfred, had branched out on their own, setting up a similar business, "Johnson Brothers" in George Street, Birmingham, England. 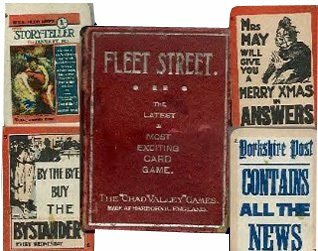 The brothers had gradually added value to the card-based games, exploring different shapes of card and creating packaging, improved rules and assorted parlour games. Occasionally they had struck on a winning line, which it seemed never went out of fashion. 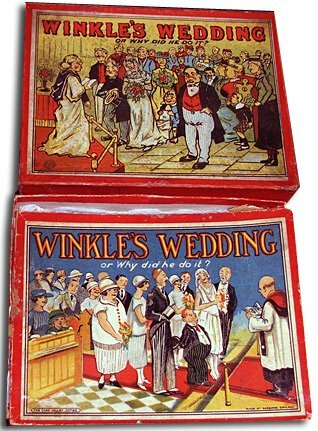 Edwardian hits like Winkles Wedding had been updated periodically ever since. As their popularity had grown and the product range had expanded, they had outgrown the premises in the city and had resolved to build a factory to their own specification. After an extensive search, the brothers selected a site in Rose Road, Harborne on the outer-edge of Birmingham. It was chosen because it offered clean air while remaining close to the commercial hub, and because it boasted a branch-line railway which would be ideal for product distribution. A fine building was commissioned, which locals admired as both stylish and elegant. It went on to serve as their headquarters for almost seventy years, and its location inspired a new trading name. Upon opening the new building was named the 'Chad Valley Works', reflecting its site in the valley of the River Chad. Product packaging was updated to show that they had been made by Johnson Bros at the Chad Valley Works. Customers soon began calling the toys "Chad Valley". The Johnsons soon adopted this as a their main marque. Raw materials were delivered to Harborne by train, with most of the factory's output leaving by the same route. Such were the volumes handled that the branch line and goods yard were retained in the 1950s when passenger trains were withdrawn. In the 1910s the Johnsons began to experiment. Copying the leading manufacturers in Europe they began to examine new materials which would allow them to expand the types of toys they made, removing the limitations of paper and card. Most of their ideas retained a strong emphasis on the printed word, and were targeted squarely towards affluent families seeking to ensure that their children were well-educated . By the outbreak of the Great War in 1914, Chad Valley had built export markets across the British Empire and beyond. Most were pitched at the well-to-do, who at the time were the only social group with the disposable income to buy playthings. Affluent families invested in such indulgences to keep their little Herberts out of the Drawing Room in the Nursery, where they could be seen but not heard. Soft toys were adopted as the first new range. The Johnsons had drawn inspiration from the German toy maker Mary Steiff. She had fashioned a family of cuddly animals, beginning with elephants before striking on the idea of a bear. 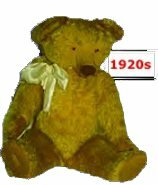 In 1903 she had exported an assortment to the USA, where the bear had become a best seller. Americans had nicknamed these 'Teddies' after their President, Theodore Roosevelt, whose refusal to shoot an elderly bear when out hunting had become legendary. 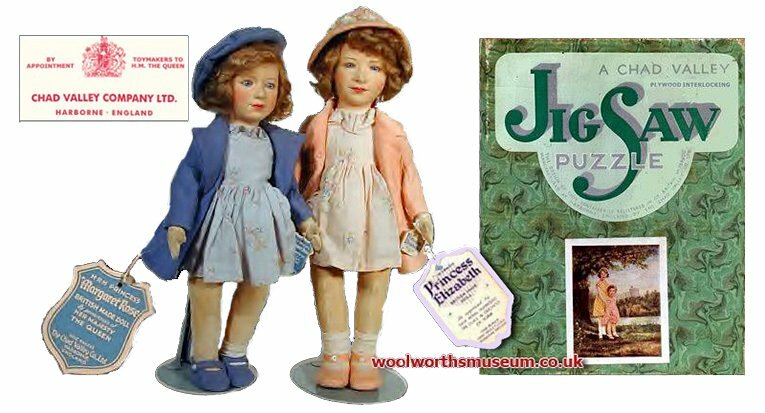 The pre-war period had also brought the first Johnson Bros dolls, which came complete with china faces. 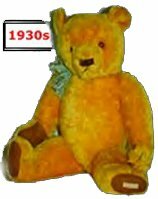 They capitalized on the interruption of Steiff supplies in the Great War, tooling up to mass-produce a rival Teddy Bear. The new models enjoyed such success during the 1910s that more capacity was needed. 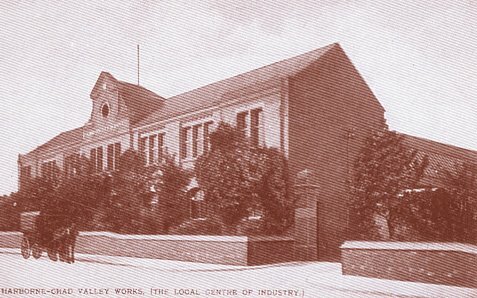 The Johnsons used the profit to buy up the rival Wrekin Toy Works in Wellington, Shropshire, which had the capacity and tools needed to ramp up production, and opened many new possibilities. Wrekin's engineers were innovative and had mastered a new, cheaper and more flexible way of making dolls. Instead of filling them with 'composition', a kind of shredded cardboard, they used felt. And instead of sewing around pre-made, fragile china faces, they had begun to shape these in celluloid, an early plastic. The acquisition also yielded a library of good-selling designs, as well as a highly-prized sales department with a near-full order book. The Johnsons had chosen well and wisely harnessed the energy and enthusiasm at Wrekin rather than trying to make changes. This produced a steady stream of new dolls throughout the inter-war period. Each was a high-class product, selling at the time for prices between five and thirty shillings (25p - £ 1.50 at the time), the equivalent of £20 - 100 at today's prices. At the time the dearest doll at F.W. Woolworth was sixpence - half a shilling - or a tenth to a sixtieth of the Wrekin price! All of the soft toys produced at both Harborne and the Wrekin works carried a sew-in label, with most reading 'Hygienic Toys | Made in England | Chad Valley Co.' or Chad Valley Co. Limited and some abbreviated to simply 'Hygienic Toys England'. What set the Chad Valley items apart was their exceptional detail. Dresses were in authentic materials, finished with lace and neatly pleated. Faces were designed with great care and hand-finished to a quality to rival Royal Doulton's porcelain 'Lovely Ladies'. Boy dolls proved very popular with the young ladies of the era, who loved their tweed sports jackets trimmed with felt collars, gun bags and of course neck ties. These were the types of clothes favoured by the country squires and aristocrats who bought the dolls. The popularity of the range rocketed when rumours circulated in 1937 that even the new Queen of England was a fan! Britain had a new Royal Family. H.M. King George VI had been thrust into the limelight after the abdication of his brother King Edward VIII. 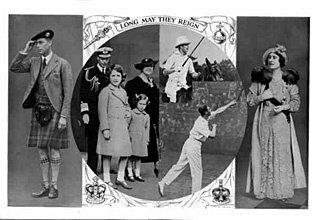 The public clamoured for stories about the new King and his wife, Elizabeth Bowes-Lyon, who had previously lived a quiet life as the Duke and Duchess of York with their young daughters Elizabeth and Margaret Rose. Public interest was heightened by a widely-held view that the Scout-Leader King and the down-to-earth Queen seemed less aloof than any of their predecessors. More in hope than expectation, Chad Valley bosses had tentatively approached Buckingham Palace requesting permission to model the two Princesses for a pair of top-of-the-range dolls and a jigsaw puzzle. To their surprise, just days later, they received a handwritten letter from the Queen, saying "yes" and proposing dates for a sitting. It revealed the girls had a number of cherished Chad Valley items in their toy boxes. As expected, the dolls and jigsaw puzzle quickly proved to be winners. Not only did they sell in vast quantities in the home market, but also in many other countries across the Empire, particularly in Canada and South Africa. Samples had been sent to the Queen, who had signed a release document without offering any feedback, leaving Executives wondering whether perhaps she had not considered them a good likeness. The fears soon proved unfounded when a parcel arrived in Harbourne by Special Delivery. It contained a Royal Warrant, declaring the company to be 'Toymakers to H. M. The Queen'. Within weeks it had been added to the boxes and sew-in labels of every toy in the range, appearing on every item made until 1952 and adapted to read 'Toymakers to H. M. Queen Elizabeth the Queen Mother' thereafter. The dolls also attracted attention from further afield in Hollywood, California. Walt Disney, who had established himself as royalty of the Silver Screen, enquired whether Chad Valley might be prepared to repeat the success by making up-market dolls to accompany his latest film. No less than eight dolls were required, seven male and one female. The film-maker is said to observed that one of the resulting samples looked a little Dopey, which made him a little Grumpy, but declared himself Happy nonetheless. The Johnson Brothers were Bashful, if a little Sleepy after all the hard work, and had to see the Doc, who was a little Sneezy. With the release signed, hey ho and off to work they went ... making thousands of sets of Snow White and her Seven Dwarfs. Today these are among the most collectable toys in the world, and rate, along with the Royal Princesses, as Chad Valley's finest work. Chad Valley's Marketing Department established a reputation for innovation. In turn they established the brand as 'Suppliers to H. M. Government', by securing contracts to manufacture toys for schools and hospitals, before becoming an official supplier to the Armed Forces as a purveyor toys for Officers' children. It later signed deals with each of the Steam Railway Companies and Shipping Lines to supply tinplate scale models of their flagship engines and liners. The finished products proved top sellers at the major ports, and at the main London railway terminii. All were distinguished by their exceptional level of detail, with a number of fully-working scale models. Their Toy Trains, for example, produced real steam, and were supplied with good quality 'O' gauge track. Their robust construction has ensured the survival of many of the originals to this day, with their clockwork engines intact. Collectors love their Thirties Cars and Lorries, which give a flavour of a bygone age. These have since inspired a number of replicas and imitations. Perhaps the most remarkable range from the Twenties and Thirties was the assortment of gambling-related products. Today these would be considered politically incorrect, but at the time it was important that the children of the aristocracy learnt about Roulette, Gaming Machines and betting on horse racing. Chad Valley's Escalado product was so popular that Waddingtons later paid a small fortune to acquire it for themselves. Meanwhile the Roulette Wheel was so well balanced, thanks to the innovative use of bakelite in the construction, that many were used by adults rather than children. Both the Wheel and the Fruit Machine remain in full working order over seventy-five years after being withdrawn from the catalogue. 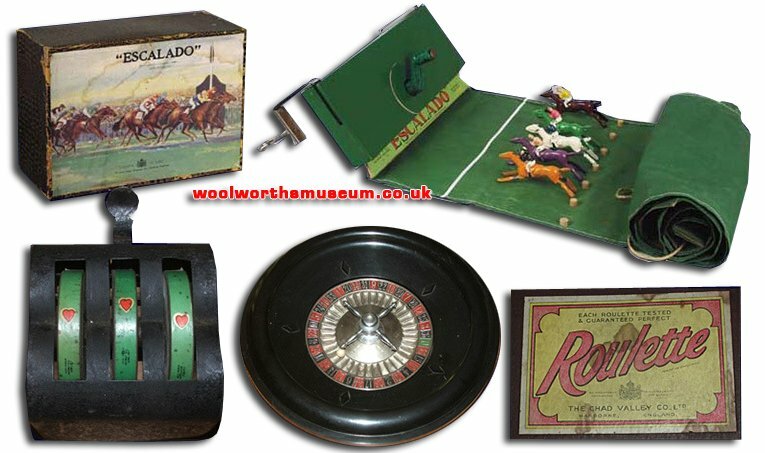 They have found a home in our Woolworths Museum Casino, so 'faites vos jeux' and 'rien ne va plus'. By way of comparison most of the toys featured on this page were more than twenty times the upper price limit in an F. W. Woolworth Threepenny and Sixpenny Store of the day. Put differently, a child could have chosen more than forty top-of-the-range Woolies items, or two hundred of its penny notions, for the price of a single roulette wheel. But would the toffs have learnt enough to run the country if they had stuck with Woolies marbles and magic tricks? No-one will ever know. But perhaps the Tories could apply the Woolies 'Magic Vanishing Trick' on the national debt. When Gordon Brown tried it during the credit crunch, it made the much-loved store chain disappear from the High Street in 2008. We have yet to find the reversing spell, though we are still looking!